The nut of the official state tree—the piñon—packs tradition, culture, and incredible flavor into one notoriously tough shell. Above: Pickers shake branches to release the nuts. WHEN ALBUQUERQUE CANDYMAKER George Buffett savored his first taste of a New Mexico piñon nut, a winning business concept was born. Barely bigger than a grain of cooked rice, the nut imparted a delicately sweet and buttery flavor, one that Buffett knew would complement his chocolates, toffees, and brittles, while evoking a unique cultural essence. The seeds of New Mexico’s official state tree, Pinus edulis, had long sustained Native peoples and Hispanic settlers. Their families organized foraging parties to wild-gather the capricious nuts, which appeared only every now and then. When a good year landed, vendors sold them by the bagful. To meld them with his candy, Buffett faced two problems: getting his hands on enough to meet what he knew would be a high demand, and cracking their small, hard shells without smashing the goods or driving his staff, well, nuts. “My dad loved them, absolutely loved them,” Patty Buffett says. “He figured this was a way to differentiate our business from other candy businesses.” It required years of building relationships with Navajo families who gather the nuts from nearby forests. And it involved the genius of an engineer who built a super-secret shelling machine that isn’t on-site, can’t be described, and, no, Patty said, will not be photographed for this magazine. Fine. The piñon story is bigger than the machine. Bigger than Buffett’s, too. It sprawls across New Mexico, seeps into the centuries, and forms some of the favorite memories and delicious dishes of those who call New Mexico home. Ounce-for-ounce as protein-rich as beef, piñons also deliver healthy fats. That one-two nutritional punch could stave off starvation when deer and fish were hard to find. One traditional preparation: Grind it with sugar into a paste called piñonate—the original Nutella! Legend has it that the trees bequeath a bounty only every seven years or so, depending on winter snows and spring rains. 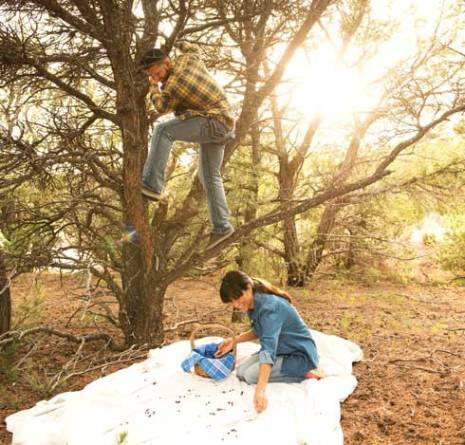 But the trees rarely agree on which year, so people like David Cuneo, owner of the New Mexico Piñon Company, scout the state to pinpoint the likeliest groves. Or you can find a substitute. New Mexicans may turn up their noses at nuts from other species of pine trees native to China and Europe. Sometimes called pignoli or simply pine nuts, their flavor is gamier, a tad piney, Cuneo says, but that can also enhance savory dishes more than New Mexico’s fairer nut. And you can buy the foreign models shelled and in bulk. That’s how David Perry, executive bakery manager for the Range Cafés in Bernalillo and Albuquerque, manages to turn out so many piñon-chile apple pies and piñon chocolate tortes. Opportunities like that come less often these days, in part because there are fewer piñon pines. In recent years, drought and bark beetles have left desiccated forests. That followed 19th-century logging operations and 20th-century grazing practices that cleared acre upon acre. Do you like the fragrance of burning piñon wood in winter? Remember where those logs came from. For New Mexicans who treasure the flavor, the wonder, and the myth of it all, the mandate is clear: Plant a tree. Plant five. You might have to wait 25 years for those babies to bear nuts, but future generations will most surely praise your name. LAST FALL, you couldn’t drive through the mountains without seeing piñon pickers lining the road. The harvest was that bountiful. It might sound like fun, but the work is hot, hard, and sticky. Think “pine tar.” If you’d rather buy them already harvested, check out Cuneo’s website (pinonnuts.com; $30 per pound, in the shell) or visit a street vendor. Cuneo advises that, if you choose the latter, be smart and taste a nut from the bag—not the sample cup. An out-of-state piñon nut, he warns, might look like a New Mexico one, but could carry a shell thick enough to crack a molar. Check how evenly the roasting was accomplished. If every 10th nut is burnt, you’re losing a lot of product for your $40 a pound. More good news: The 1987 New Mexico Pine Nut Act outlaws labeling and selling outsider nuts as one of ours. New Mexico chefs have devised various ways to bring the piñon nut’s mellow flavor into main dishes, sides, and desserts. We asked a few for recipes that could elevate a Thanksgiving feast. If New Mexico piñons aren’t available, you can substitute other varieties, which are generally available at grocery stores already shelled. 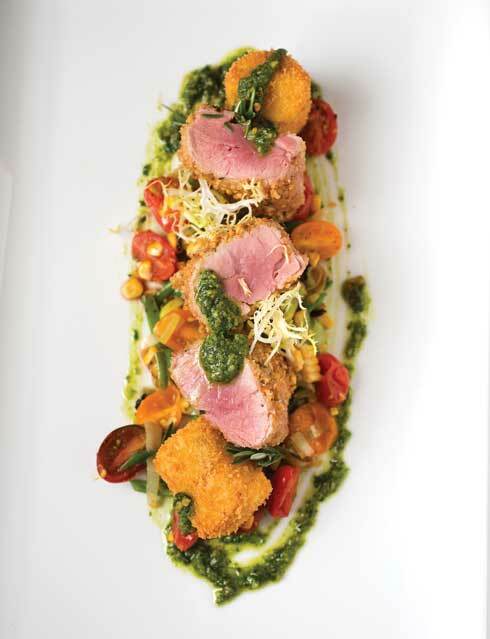 Recipe courtesy of Sllin Cruz of Geronimo restaurant in Santa Fe. To make the pesto: Blend 1 cup of toasted piñon nuts, basil, spinach, parsley, garlic cloves, Parmesan cheese, and extra virgin olive oil in a food processor. Add salt and pepper to taste. Sprinkle salt and pepper on the tenderloin and rub the mustard onto its surface. Blend 1 cup of the piñon nuts and the panko crumbs in a food processor. Cover tenderloin with the crust mixture. Heat a sauté pan and sear tenderloin with 1 tablespoon of butter until browned. Put in oven at 350° for 12 minutes. Remove from oven and allow meat to rest for 5 minutes. Cut into equal portions and serve with pesto. Recipe courtesy of Freddie Bitsoie of Mitsitam Café at the National Museum of the American Indian in Washington, D.C. In a sauté pan, sweat the onion in the oil over medium heat, then add the thyme, bay leaf, salt, and pepper. Pour in stock, bring to a boil, and reduce the heat to a simmer for about 15 minutes. Pour the soup into a blender and purée until smooth. Strain it through a sieve back into the pan, bring to a boil, then reduce heat to a simmer for about 5 minutes. Add the milk and adjust the seasoning. Serve hot, garnished with mint and piñon nuts. Recipe courtesy of Chef Travis Tegreeney of Y’aak’a Café at Acoma Pueblo. Halve the acorn squash lengthwise and scoop out seeds. Brush the flesh with olive oil and sprinkle lightly with salt, pepper, and coriander. Place in 350° oven for 35–40 minutes until fork-tender. Meanwhile, bring the chicken stock to a rolling boil, add the wild rice, and season with salt and pepper. When the mixture returns to a boil, reduce heat, cover, and simmer for 40 minutes until tender. Heat a sauté pan on medium, add piñon nuts, and cook for 3–4 minutes, stirring occasionally to avoid burning. Remove from heat when the nuts are lightly toasted. Add to wild rice. Stuff rice mixture into cooked squash and serve. Optional: Top with your favorite chile sauce. Recipe courtesy of David Perry and Matt DiGregory of the Range Café, Albuquerque and Bernalillo. Preheat oven to 350°. In a saucepan or microwave, melt the chocolate with cup of the heavy cream. Set aside to cool. In a food processor, grind the nuts until chunky. Generously butter the bottom and sides of a 9-inch springform or cheesecake pan. Put the nuts in the pan and tilt to cover the bottom and sides. Gently tap out any nuts that don’t stick and return them to the food processor. Add the flour to the remaining nuts and pulse to create a coarse flour. Place the eggs, vanilla, cinnamon, and sugar in a metal mixing bowl. Place the bowl over medium heat and whisk continuously until warm. (This helps dissolve the sugar into the eggs.) Put the bowl in a mixer. With a wire whip, beat the eggs until tripled in volume and thick. Fold the egg mixture into the cooled chocolate, then fold in the remaining nut and flour mixture. Whip cup heavy cream to very soft peaks. (Do not overwhip.) Fold into the batter. Pour the batter into prepared pan and bake for exactly 15 minutes. Remove and cool. The torte will appear to be undercooked, but this is the desired appearance. Serve with the remaining cream, freshly whipped.